How long have you worked at Cranfield? I have worked at Cranfield University since October 2014. However, initially I worked as a technician in the Small Scale Explosive Testing sector of the Chemistry Department. I have been in my current role since August 2015. My official job role is an Advanced Level Apprentice in Mechanical Engineering which means during work time I am constantly learning in a hands-on environment from the experienced members of the workshop. I’m also learning endless engineering techniques as there is always more than one way to accomplish a task. As I’m into my second year I am now undertaking official jobs for different departments. This involves interpreting drawings, establishing communications with people and having a complete understanding of how the manufacturing process will take place to the point that I’m comfortable taking on a task and completing it. During my first year, many of the jobs that were undertaken, were called ‘apprentice jobs’ where, under the close eye of Karl Norris and the other members of the workshop I developed my skills as an apprentice both with manual tools and then moving onto the machines. In addition I am attending college one day a week where I cover a wide range of educational subjects varying from engineering science to analytical maths to health and safety. Currently I am working on a number of different jobs, one of which being a skateboard that is powered by hand drill motors. This was a task given to us as a result of the Tom Nevard project. This involves the other apprentice, James Gale, and I designing and creating a way in which we could use the drill motors to give mobility to the skateboard without human input. I am also currently being put through my HNC in Mechanical Engineering by Cranfield which is the one day a week referred to earlier, which is very involved and is a lot of work outside of the classroom but very rewarding. What made you choose an apprenticeship route? Personally I never heard of apprentice routes when it came to me leaving school, I was pushed towards the idea of college by the careers department and then from college to university; there was never any real information on apprenticeships. However, that’s not to say I wasn’t looking. 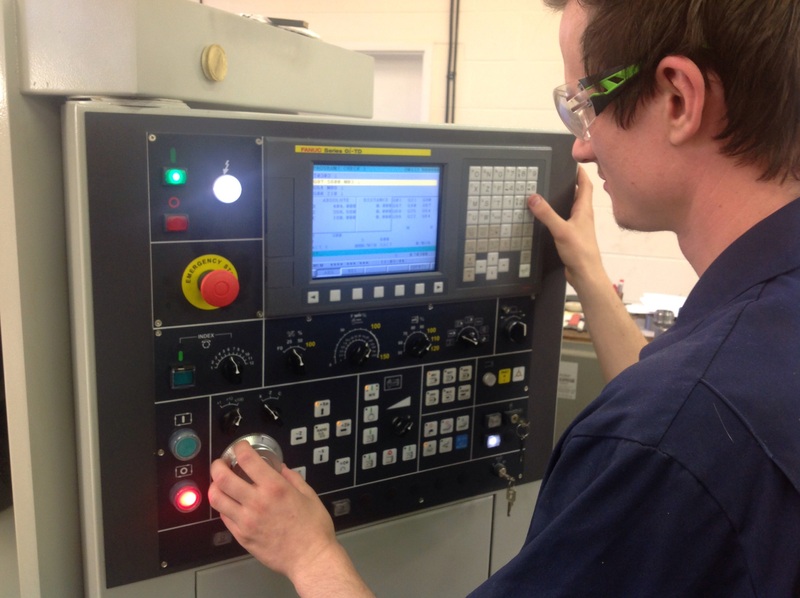 What really made me choose an apprenticeship was the idea that I could study the theoretical side of the job whilst carrying out the actual in-depth work, which in this case is carried out in the workshop where I have the ability to get hands on and grow my knowledge in a real world working environment. It’s also incredibly beneficial as it means I’m able to effectively gain qualifications in my desired field and work and earn a full time salary which to me makes more sense than doing one or the other. What were you doing before you came to Cranfield? Before Cranfield University I completed three years at Cirencester College gaining my A levels so that I would be able to go to university. I was never hugely keen on the idea of going to university and studying something that I wasn’t sure I wanted to study or even have a career in just because everyone else around me was. It was only when I started to write my personal statement and apply for spaces that I realised university wasn’t the right route for me at the time. After that I worked behind a bar earning some money to run my car and tried to figure out what it was that I wanted to do for the rest of my life. Then I worked in the Energetic Materials test house here at Cranfield University for 10 months until I heard of this job opening and I saw a chance to pursue a career in a field that I enjoyed with an opportunity of further learning. How did you hear about Cranfield? I have a family member who works inside the university so I have been aware of the university for a long time but it was this family member who informed me of the job opening. As I was already on-site, I was able to come across and ask the Head of Technical Services, Karl Norris, when the application process for the position actually opened. From there it was just a case of trying my best and following the application route. How do you feel you’ve benefited from your apprenticeships so far? I think this apprenticeship has been a huge factor in my life. I have met a lot of great people, in the workshops and in other departments; people that are always there to help and give advice. Then there are the qualifications I have attained so far which have added worth to me as an employee. I am now qualified to drive the fork lift, I have a Distinction in Level Three mechanical engineering (which enabled me and the other apprentice to miss the second year of that course and go straight on to the HNC), I have completed a one week welding course in Bridgewater, I’ve completed an Explosive Awareness course and I’m currently working through my HNC, which, all being well, will lead to a HND and possibly a degree top-up. I have also been gaining experience in other areas of work. As part of the apprenticeship, we are seconded to other areas to gain an insight and experience of other working departments. So far I have completed work in Building 18 with Dr Appleby-Thomas’s group and their high velocity gas guns and at the Bashforth Range with Professor Ian Horsfall’s group on the ballistic ranges. It’s an enriching experience to be in such a varied environment where there is so much to learn. What attracted you to Cranfield? I had always heard good things about Cranfield and the work that is carried out here. There were a number of factors that interested me about this position. Firstly, I knew the job wouldn’t be an industrial engineering job, that the work I would be doing would largely be varied and based. I also know that it would be used for research which again is amazing. It’s brilliant to think that something I’ve made is being used for research to help support or discover something new or unique. Is there a particular aspect you’re most looking forward to? I’m just looking forward to what the future brings. There are so many options open for me to what I can do and what can be achieved through this apprenticeship and the knowledge I will have gained and the people that I have met. How have you been supported in your role? Incredibly so, not a day has gone by when I haven’t had the support of one or more of the staff in the workshops. Everyone is so helpful and willing to give up their time to help me if I’ve made a mistake or if I’m in doubt of anything. It’s always a nice atmosphere in the workshops with everyone getting along and the jokes flying, I never feel like I’m going to have a bad day at work. Please note: Rob Peare is no longer an apprentice at Cranfield University.